BINAN, LAGUNA — Around 200 children mostly from provinces in the Autonomous Region for Muslim Mindanao (ARMM) flew to Manila over the weekend to participate in the annual Philippine Marine Corps (PMC) Football for Peace festival, a continuing advocacy to promote peace through sports especially to children in areas marred with armed conflicts. Aspiring football players aged 8 to 14 years old began to arrive in teams via C130 planes at the Villamor Airbase in Pasay City on Sunday, April 30. These kids came from various Philippine Marine and Philippine Army detachments in Palawan, Aklan, Sulu, Basilan, Tawi-Tawi and Sultan Kudarat, many of whom have never experienced traveling outside of their hometowns. “The purpose of ‘Football for Peace’ is to leverage the sport to engage children, especially those traumatized by armed conflicts in Mindanao and provide them the opportunity to experience life away from the war,” explained Lt. Col. Stephen L. Cabanlet, commanding officer of the 1st Marine Battalion Landing Team stationed in Sulu and founder of the PMC Football for Peace movement. “We hope that by exposing these children to communities made progressive by peace, they would take home the aspiration and develop a wider perspective about their future,” he added. The advocacy, which was started by Cabanlet and his comrades then station in Luuk, Sulu in 2011 has spread through the Philippine Marine Corps and then to other branches of the military such as the Philippine Army. What used to be barangay-level tournaments between amateur teams trained by Marine soldiers eventually evolved into a festival held annually in Metro Manila. Support from the private sector has also been increasing with Meralco and its corporate social responsibility arm, One Meralco Foundation (OMF), among its staunchest advocacy partners. “We first learned about the PMC ‘Football for Peace’ in 2012. They were in need of training balls with which the children could hone their playing skills even at home. Inspired by the noble cause of the advocacy, we donated 400 soccer balls and partnered with Meralco’s Philippine Football League team, the FC Meralco Manila (formerly the Loyola Meralco Sparks Football Club), to come up with a regular football clinic program that would allow the kids to learn from the pros,” shared Jeffrey O. Tarayao, President of One Meralco Foundation and Chief CSR Officer of Meralco. 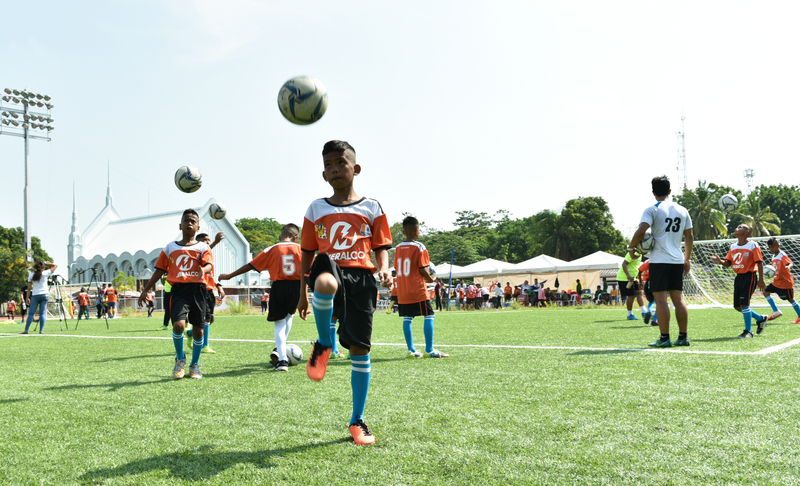 Since 2013, the Meralco football clinic has been a part of a series of activities held throughout the week-long festival. Apart from the clinic, the participants also embark on educational trips to museums, tourist landmarks, shopping centers and theme parks before competing in a football tournament against established football teams from Metro Manila and Luzon on the last day of the festival. “Football for Peace is more than just learning how to play football and being good at it. Many children in war-torn communities grow up into adulthood and die without seeing peace in their horizons. We want to open up their minds to the reality that peace is actually not impossible to achieve. We just have to work on it together and cultivate the values that promote it such as discipline, teamwork, camaraderie and friendly competition,” said Rookie Nagtalon, co-founder of the PMC Football for Peace movement. To formally open this year’s festival, a football clinic for the kids was hosted by One Meralco Foundation on Tuesday, May 1, at the newly erected Biñan Football Stadium in Laguna. James Younghusband, team captain of the FC Meralco Manila, and his brother Phil were among those who facilitated the clinic which taught the participants several warm up exercises, endurance drills, proper ball handling, kicking, among others. 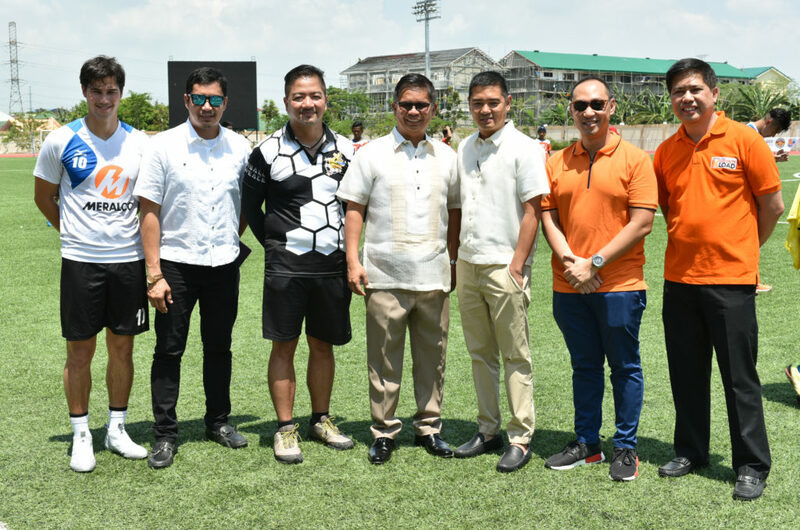 The event was organized in partnership with the city government of Biñan and the MVP Sports Foundation, an institution founded by Meralco Chairman Manuel V. Pangilinan which promotes sports development programs in the grassroots. Fast-food chain Jollibee also supported the clinic by providing food and refreshments for the participants, coaches and trainers. To reach out to more children in Mindanao, One Meralco Foundation brought the Football for Peace clinic to Bongao, Tawi-Tawi in 2015 in which 200 children and civilian coaches from Tawi-Tawi and Sulu participated, and to Zamboanga City in 2016 benefiting 200 participants from the city and nearby Basilan province.